Our 3-per-page manual business checks conveniently store in a binder making payments and tracking expenses effortless for all-purpose use. Easy to record payment information with side tear end stub vouchers. Transactions are efficient with the standard security features included in these manual business checks. 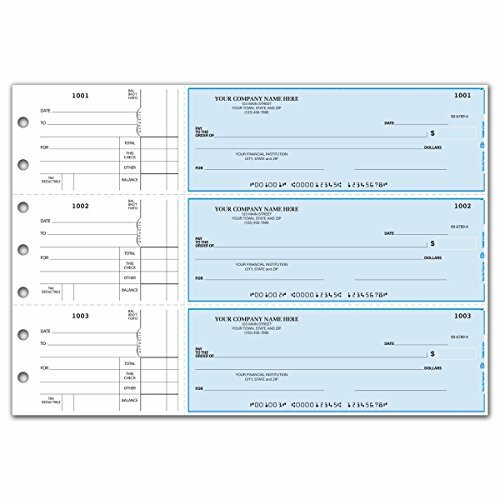 Efficiently keep your records organized with the perforated side-tear manual business checks. Free personalization. Includes your business and bank imprint.SatisfactionAt CheckSimple, your satisfaction is 100% guaranteed. Not happy with your business check or deposit slip order? No problem. Just contact us and we'll take care of you!SavingsIt's simple. Our goal is to offer you high-quality business checks, deposit slips, and accessories at low, everyday prices. Compare our business checks and accessories with anyone else and we think you'll agree, CheckSimple has the perfect business checks and accessories for any business and any budget. 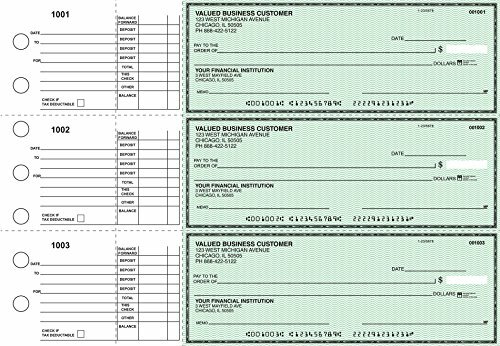 These popular 3-to-a-page binder checks help thousands of businesses pay & track expenses easily! 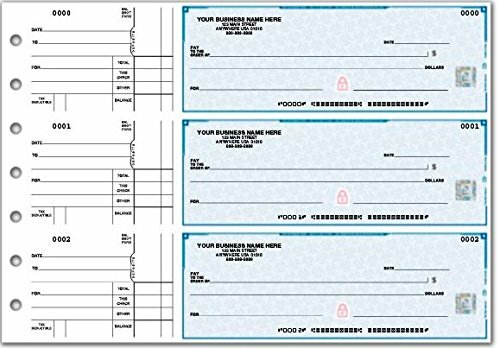 Just copy check details to handy side tear vouchers for a permanent transaction record you can take anywhere.Best-selling side tear business checks simplify recordkeeping for all kinds of payments! 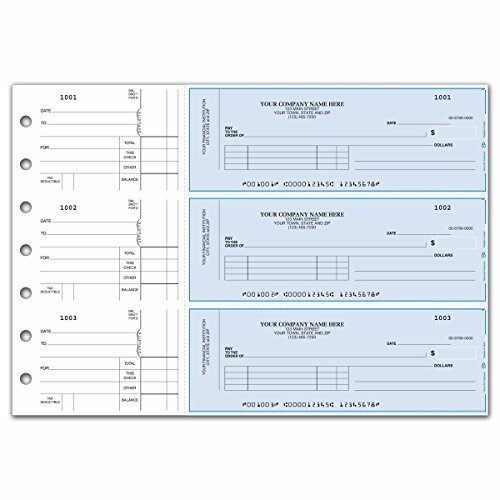 Check detached: 8 1/4" x 3" and check with the stub: 13"x 3" Manage accounts payable and payroll transactions with Multi Purpose business checks. Available in single or duplicate format and a stub located to the left, record keeping is made simple. 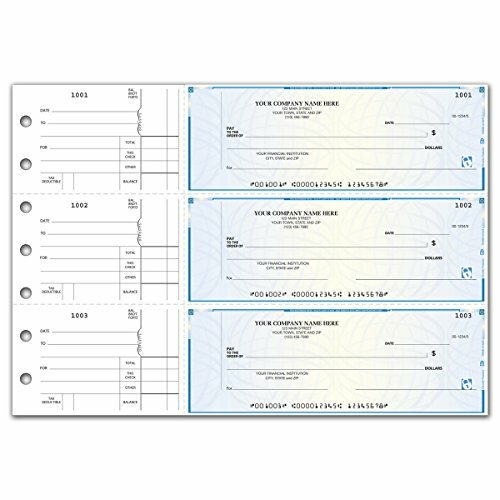 Reasonably priced and options available to personalize your checks. All business checks are designed to fit with our 7-ring business binder, for convenient and safe storage. Security: Void Pantograph with Verification Grid, Anti Copy Technology, Safety Hologram, Chemically sensitive paper, microprint border, invisible fluorescent fibers, erasure protection, security screen & warning box, Heat-sensitive ink, visible embedded fibers, chemical-wash detection area and true watermark. Business Sized three to a page checks with seven hole punch and left stub. We will contact you for imprint information. Checks do not include duplicate. Protect your company with our NEW high security business checks with additional security features. 3-per-page manual business checks conveniently store in a binder; making payments and tracking expenses effortless. Easy to record payment information with side tear vouchers. Improve the odds of fraud being detected by tellers, merchants or employees by using business checks with more security features. high security business checks help protect you from check fraud using visible and invisible embedded security features including chemical sensitive paper, true watermark, microprint, fluorescent fibers, and more! 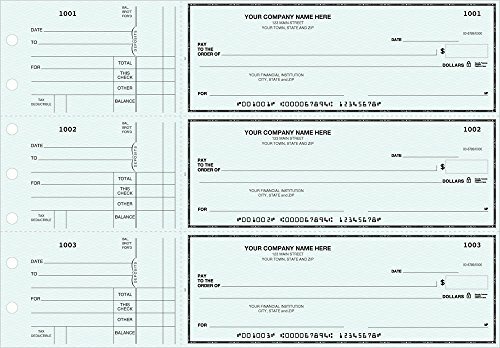 Bring efficiency and organization to your record-keeping with perforated, side-tear business checks. Free personalization includes your business and bank imprint.SatisfactionAt CheckSimple, your satisfaction is 100% guaranteed. Not happy with your business check or deposit slip order? No problem. Just contact us and we'll take care of you!SavingsIt's simple. Our goal is to offer you high-quality business checks, deposit slips, and accessories at low, everyday prices. Compare our business checks and accessories with anyone else and we think you'll agree, CheckSimple has the perfect business checks and accessories for any business and any budget. Protect your company with our NEW high security manual business checks with additional security features. 3-per-page business checks conveniently store in a binder; making payments and tracking expenses effortless. Easy to record payment information with side tear vouchers. Improve the odds of fraud being detected by tellers, merchants or employees by using business checks with more security features. Secure business checks help protect you from business check fraud using visible and invisible embedded security features including chemical sensitive paper, true watermark, microprint, fluorescent fibers, and more! 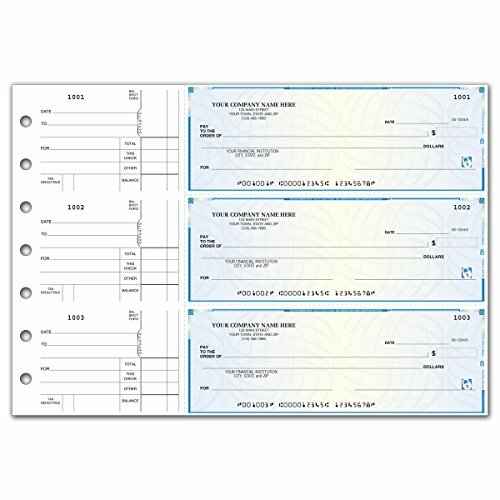 Bring efficiency and organization to your record-keeping with perforated, side-tear business checks. Free personalization includes your business and bank imprint.SatisfactionAt CheckSimple, your satisfaction is 100% guaranteed. Not happy with your business check or deposit slip order? No problem. Just contact us and we'll take care of you!SavingsIt's simple. Our goal is to offer you high-quality business checks, deposit slips, and accessories at low, everyday prices. Compare our business checks and accessories with anyone else and we think you'll agree, CheckSimple has the perfect business checks and accessories for any business and any budget. Our 3-per-page manual business checks conveniently store in a binder making payments and tracking expenses effortless. Easy to record payment information with side tear vouchers. Transactions are efficient with the standard security features included in these business checks. 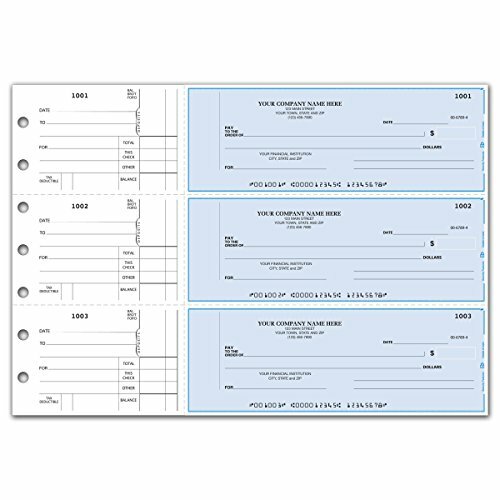 Efficiently keep your records organized with the perforated side-tear business checks. Free personalization. Includes your business and bank imprint.SatisfactionAt CheckSimple, your satisfaction is 100% guaranteed. 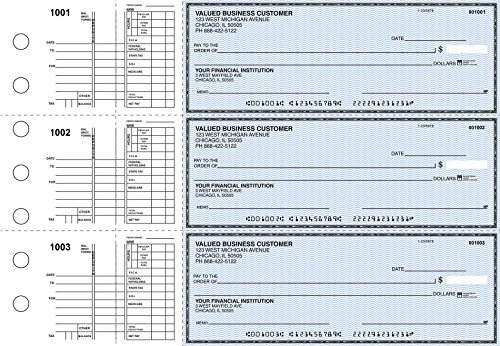 Not happy with your business check or deposit slip order? No problem. Just contact us and we'll take care of you!SavingsIt's simple. Our goal is to offer you high-quality business checks, deposit slips, and accessories at low, everyday prices. Compare our business checks and accessories with anyone else and we think you'll agree, CheckSimple has the perfect business checks and accessories for any business and any budget. 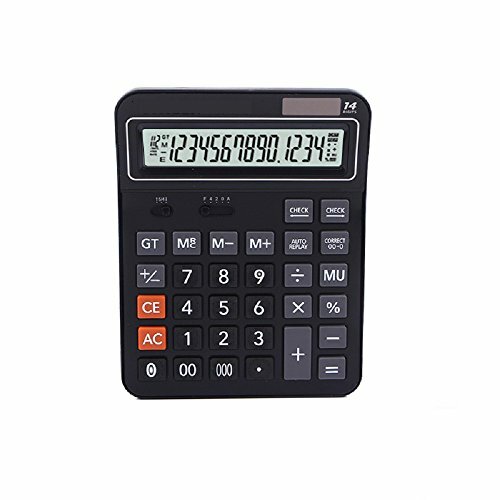 Product description:100% brand newFinancial Professional Standard CalculatorsPerfect is suitable for family,office,school,engineering,finance,office, etcName: Desktop Calculator100% Brand NewPlastic non-slip key, the function is all ready.The double function of solar and battery, let the calculator for longer service lifeLight touch keyboard, not easy card key Package included: 1x Calculator 1*AAA Battery 1x User Manual Note: 1.Please allow a little size error due to manual measurement. 2.Please be reminded that due to lighting effects and monitor's brightness/contrast settings etc, the color tone of the website's photo and the actual item could be slightly different. Wish your shopping happily! Copyright © Wholesalion.com 2019 - The Best Prices On Manual Business Checks Online.